Background: We ranked Single Port Surgery (SPS) and NOTES (full-thickness gastrointestinal resection involving D1 radical dissection) as a surgical procedure between endoscopic submucosal dissection (ESD) and conventional laparoscopic surgery. In SPS, however, we have to control many kinds of devises through narrow single port. Furthermore, in NOTES, we needed to solve the following problems: disappearance of working space in association with air leak due to surgical punching of the gastrointestinal tract at entry into the peritoneal cavity; and paucity in the number of forceps for manipulation to achieve lymph node dissection at the D1 level. 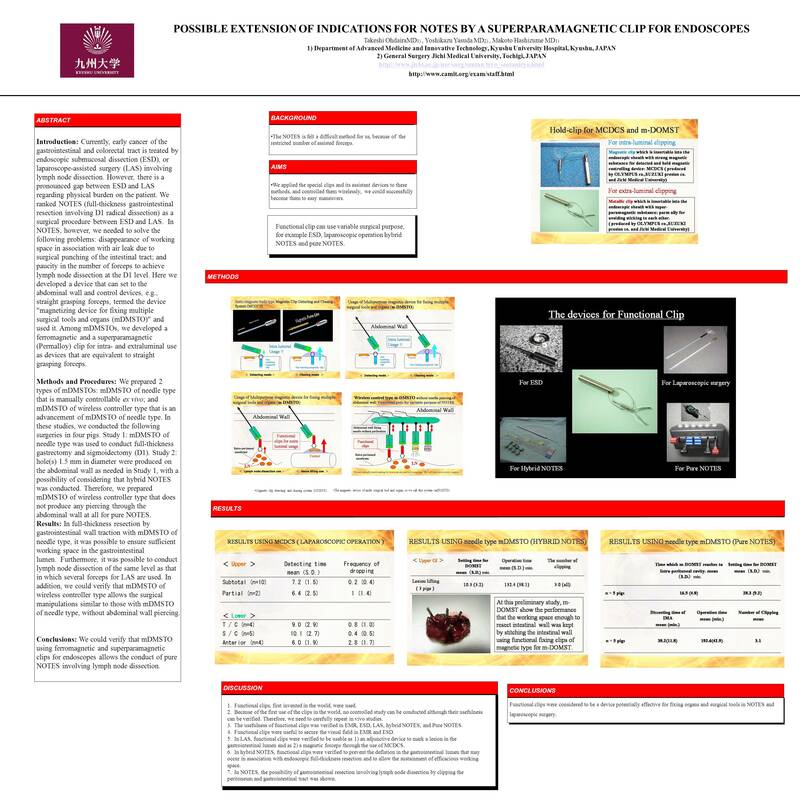 Here we developed a device that is pierceable through the abdominal wall and that can set and control devices, e.g., straight grasping forceps and CCD camera, termed the device “magnetizing device for fixing multiple surgical tools and organs (mDMSTO)” and used it. Among mDMSTOs, we developed a ferromagnetic clip for intraluminal use and a superparamagnetic (Permalloy) clip for intra- and extraluminal use as devices that are equivalent to laparoscopic forceps. Methods: We prepared 2 types of mDMSTOs: mDMSTO of needle type that is manually controllable; and mDMSTO of wireless controller type that is an advancement of mDMSTO of needle type. Study 1: mDMSTO of needle type was used to conduct full-thickness gastrectomy and sigmoidectomy (D1). Study 2: hole(s) 1.5 mm in diameter were produced on the abdominal wall as needed in Study 1, with a possibility of considering that hybrid SPS and NOTES was conducted. Therefore, we prepared mDMSTO of wireless controller type that does not produce any piercing through the abdominal wall at all for pure NOTES and conducted sigmoidectomy involving D1 radical dissection. Results: In full-thickness resection by gastrointestinal wall traction with mDMSTO of needle type, it was possible to ensure sufficient working space in the gastrointestinal lumen. Furthermore, it was possible to conduct lymph node dissection of the same level as that in which several forceps for SPS are used. In addition, we could verify that mDMSTO of wireless controller type allows the surgical manipulations similar to those with mDMSTO of needle type, without abdominal wall piercing. Conclusion: We could verify that mDMSTO using ferromagnetic and superparamagnetic clips for endoscopes allows the conduct of less invasive endoscopic surgery involving lymph node dissection.